Thank you for downloading this freebie! It helps students build spelling and sight word recognition skills. 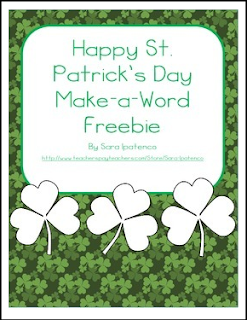 Students cut out the “Happy St. Patrick’s Day” words at the bottom of the page and use them to make new words. As they make new words, the students write the words on the lines. Print the page on green paper to make it even more fun! Happy St. Patrick’s Day!